William & Kate arrive at the Met, December 9, 2014. Getty Images. I feel like the subtitle of this Royal Visit to New York City, with the exception of the last night, could be subtitled “The Coat Tour.” Kate owns some gorgeous coats and it was fun to see her on our local news out and about in Manhattan and Brooklyn wearing all of them. If you want full coverage of the visit, with amazing details of every single thing she had on, do head over to Duchess Kate, my go-to site for all things Kate related, especially her fashions and accessories. There are some snarky comments by readers about Kate’s skirts being too short and not “age-appropriate” (what? ), but I vote the legs stay. She’s not yet 33 and she definitely has the gams, so why can’t her dresses be above the knee sometimes? For Kate’s New York City sartorial selections, I repeat my assessment of what she wore during her tour of New Zealand and Australia—I think she is modern and true to herself and making really great fashion choices, which never feel forced. I also think her clothes reflect who she is and her place in society. I loved this plum coat by Seraphine with Lurex threads woven throughout. A wonderful Seraphine coat on Kate! Getty Images. 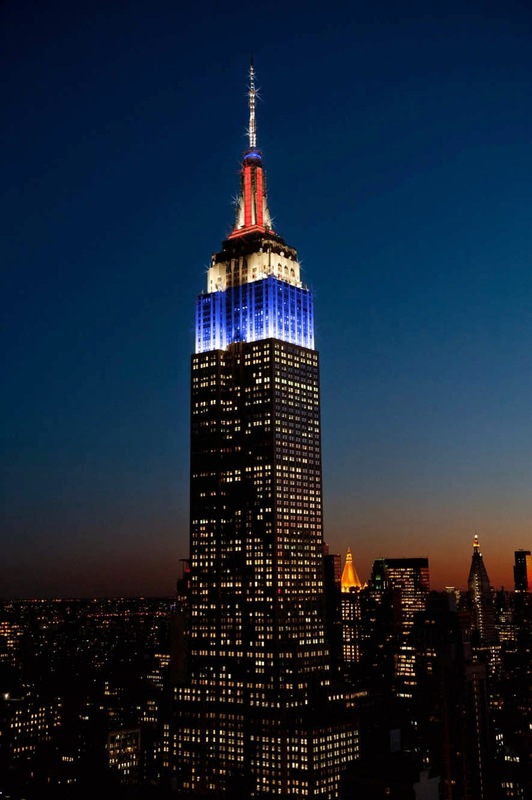 Love that the Empire State Building was lit up in their honor! Gorgeous shot! I hoped black lace was going to make an appearance and I was not disappointed! Kate wore this very pretty black lace dress by Beulah London out to dinner the night she and William arrived. Lovely in lace. Getty Images. Meeting with Chirlaine McCray. Photo by Carl Court. I was a big fan of this coat by GOAT Kate wore to meet Chirlaine McCray, wife of New York City Mayor Bill de Blasio. A different angle of the same shot. Great coats on both ladies! Photo by Neilson Barnard. Surprising choice for a b-ball game! Photo from Harper’s Bazaar. What a lovely Tory Burch coat! She wore this to the Barclays Center here in Brooklyn to catch a basketball game between the Nets and the Cavaliers. The Toothpick jeans are by J. Crew. 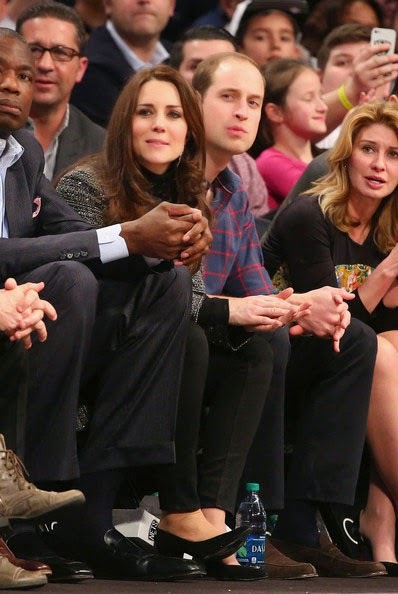 Kate & William at the game. Photo by Al Bello. For their last (very full) day, Kate wore this gorgeous hot pink Mulberry coat. Some people took exception to her wearing it to the 9/11 Memorial and Museum, saying it was not somber enough, but I do not count myself among them. It was a rainy mess on the day they visited and I love it when a woman wears a bright color on a dreary day, don’t you? Going to the 9/11 Memorial. Photo by Carl Court. At NeueHouse. Photo by Mike Coppola. I would know those geek-chic glasses and ombré sequined pailettes anywhere! 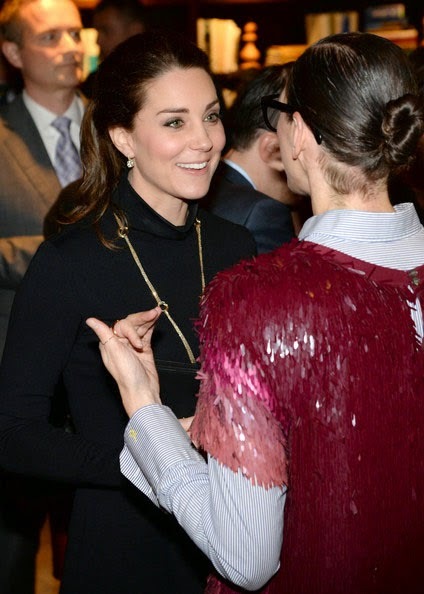 Kate chatted with J. Crew’s Jenna Lyons at an event at NeueHouse, where she told Jenna that she had worn J. Crew jeans to the Nets game the night before. I loved Kate’s simple black dress by Seraphine and Cartier Trinity necklace! Kate with J. Crew creative director Jenna Lyons. Photo by Kevin Mazur. Arriving at the Met for the 600th Anniversary Dinner for St. Andrews. Photo by Neilson Barnard. 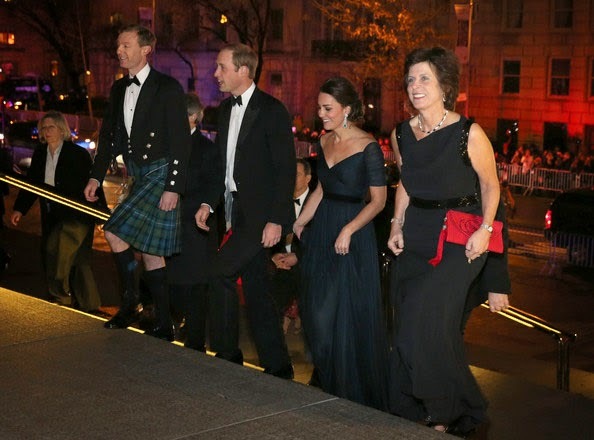 Kate wore a beautiful gown by Jenny Packham for the St. Andrews University 600th Anniversary dinner held at the Met. She broke out the big jewelry too, look at those gorgeous (and huge) diamond and emerald earrings, and matching bracelet! I’ve read that she’s donned this dress twice before, but I do love a duchess who believes in wearing something more than once! Amazing jewelry on Kate. Getty Images. I hope they return to New York for a longer trip next time and bring Prince George and the new baby with them! What did you think of Kate’s clothing choices during this visit? I think her choices are (almost) always impeccable. She nails it. And I love that pink coat on her. I like the pink coat as well and while my dear Kate can do no wrong, I would have suggested hemlines just a little longer on a couple of those outfits. They are fine for her age group of course but this was an official visit after all and I am sure they gave my dear QE2 a wincing grimace with her breakfast tea. So chic...so stunning...every decision a good one...I loved the post, Jill. She is such an inspiration for all ages with her dress. I love her choices especially the ball gown. Absolutely stunning and very flattering. She's always a class act, just like you! Love the pink coat especially! Such a lovely couple. She has great taste. Clean, uncomplicated lines and details. Great choices for her stature and position. I wonder what they thought of the basketball game. I always love everything Kate wears. I'm surprised she didn't wear something more casual to the basketball game; she dressed in jeans when they were at the Calgary Stampede here in Canada a couple of years ago. Still...she looked lovely in everything. Guess Prince William will have to paraphrase JFK and say that he was "the man who accompanied Kate to New York." GSL doesn't fall for hearsay nonsense over at Duchess Kate. They are either thinking of Liz Taylor in Cleopatra or falling for some photoshop hoax. Perhaps EJS can do a post on these racy QE2 pics???? GSL, ha, you always crack me up. I have to go check in at Duchess Kate to see what they are saying now. I was appalled at the plain meanness about Kate over there. Who are these people? And seriously, I would LOVE to see what they are wearing as they tap out the harshest comments about Kate's clothes, hair, makeup, and jewelry. I bet they felt so sad seeing poor young William at his mother's funeral and yet all these years later they are saying the most terrible things about his wife, who lives under even more intense scrutiny than his mother did! I wish those readers would give that young lady a break!